I took a cab home tonight from downtown DC to Cleveland Park after working late. The ride was fairly uneventful, although I thought the driver was somewhat unskilled in terms of changing lanes. He also seemed to be unable to press the gas pedal evenly, and the car basically lurched all the way home. I noticed the credit card machine had a large sticker on the bottom that said “DON’T PLAY WITH SCREEN”, but I thought nothing of it. When we got to my building, I asked to pay with a credit card. He gave me the usual “but don’t you have cash?” line, and I truthfully said no, I didn’t. Besides, I was going to pay with my work credit card since I was working so late, and processing the expense report is much easier with a card (that also means I typically give a large tip, so I hardly think it’s unfair). Because I’m so used to paying for cabs by card, I hit the “credit card” button on the touch screen as soon as I see it. The screen then gives me an error, and the cabbie immediately says I’ve broken the machine by merely touching it. I nonetheless sit there while it boots back up, and then I again have a chance to pay. But the machine can’t read my card, after several tries and two different cards, it doesn’t work. I tell him that this is his problem and he is required to have a working card machine, and he then puts the car in drive and starts to pull away, planning to take me to an ATM. At that point I say hell no, and I get out of the car as he’s moving at low speed (luckily, my building has a traffic circle, which he drove the wrong way around, so he had to make some 3 point turns). I go to the door, and sadly I didn’t have my keys, so I had to call the front desk, who let me in. The cabbie (who was an older Asian gentleman with limited English) follows me to the door (without my permission) and gets in my face, pointing at me and screaming “You no want to pay! !” I tell him to call the cops to resolve it, and he says he will, but he follows me into my building anyway. I go to the desk but he stays with me, and I realize he’s not going to let me go. Even though I kept telling him that he could call the cops, and then have the front desk call me down from my unit when they arrive(I didn’t want to tell him my unit), he refuses, so finally I call the cops. He then sits in our lobby as we wait even though I repeatedly ask him to wait outside. The cops arrive about 15 minutes later by foot (or at least I didn’t see their car anywhere). I give my side of the story in about 1 minute, and then they proceed to ask him about his side. They quickly recognize that if his credit card machine “breaks” the moment anyone touches his touch screen, he’s in violation of the taxi regulations. They also look and see that his sign says “Don’t Play” with the screen, not “don’t touch.” The cabbie is insistent that the machine worked all day fine, and that I was the one who broke it and I just don’t want to pay (which is untrue — I would have gladly paid, but I drew the line when he tried to drive me somewhere without my permission and kept the car moving while I got out). He then claims that he told me that the machine didn’t work when I got in the car (which is not true and contradicts the entire fact that he was trying to get me to use the machine at all). At this point the cops are already concluding that his machine is in violation and that he’s going to get a citation for that. The cops then ask for his “manifest” (which I guess is the equivalent of his license that permits him to be working), and after pretending to search for it, he says he doesn’t have it and he left it at home. The cops are somewhat incredulous, as that’s apparently yet another and more serious violation, and by now they’ve already called the hack inspector. Apparently he is not even supposed to be working. At that point the other officer then told me I could go if I wanted, and I left it at that. I feel somewhat bad for what happened — I had no intention of not paying for the ride, as I hardly need a free ride and I wasn’t paying for it in the end anyway. I didn’t intend to escalate the encounter, but when he began driving away I said that was it. His behavior afterward — forcing his way inside, following me around, getting in my face, and sitting there a demanding I call the cops, was extremely in appropriate. I am a tall and large male and can fend for myself against that sort of thing, but I wonder what happens to people who aren’t. 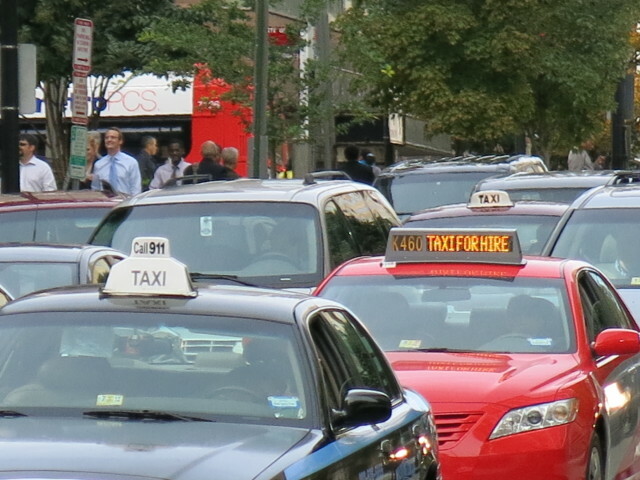 I’m getting tired of the number of cabs I encounter who are providing such poor service — be it broken or non-standard card machines — loud radios (I had the joy of listening to a loud and obnoxious gospel sermon on my way home a week ago), talking on the phone, unsafe driving, etc. What is it going to take? My Uber experiences have been problematic too. This is just getting frustrating.